Give us your opinion in the comments section below for your chance at winning a six-month Card Player magazine digital subscription. Ask any group of poker players how you played your hand and they’ll come up with dozens of different opinions. That’s just the nature of the game. Each week, Card Player will select a hand from the high-stakes, big buy-in poker world, break it down and show that there’s more than one way to get the job done. Four-handed, in the $10,000 PokerStars Spring Championship of Online Poker (SCOOP) main event, ’th’Kick’ with 61 big blinds folded from under the gun and Harrison ‘gibler321’ Gimbel min-raised to 400,000. 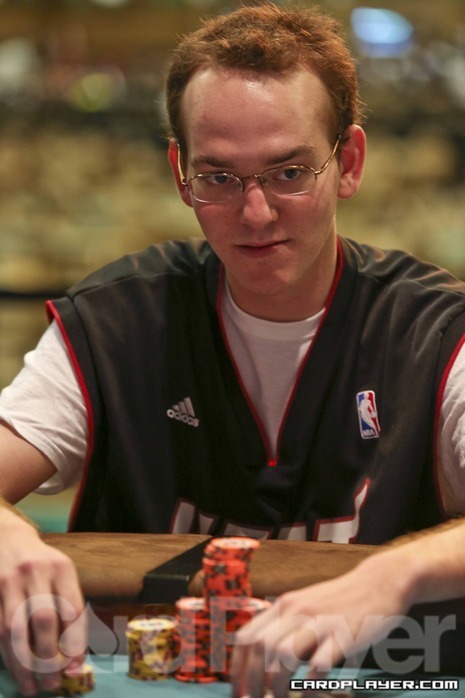 Gimbel began the hand in third place with 32 big blinds. The chip leader, Charlie ‘Epiphany77’ Carrel with 67 big blinds, folded from the small blind and ’Garrin4e," called from the big blind. The flop fell A A 4 and ‘Garrin4e’ checked. 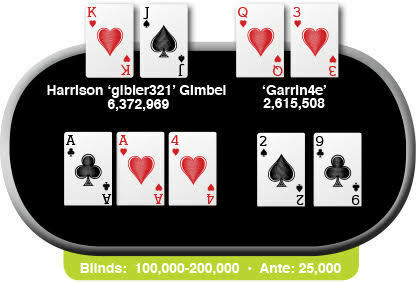 Gimbel bet 300,000 and ‘Garrin4e’ check-raised all-in for 2,190,508. Gimbel decided to make the call with just K J for king high, and it was good against the Q 3 of ‘Garrin4e.’ The turn and river fell 2 9 and ‘Garrin4e’ was eliminated. How do you feel about Gimbel’s preflop raise sizing against a short stack in the big blind? Does ‘Garrin4e’ have enough chips behind to justify calling a preflop raise with just a suited queen? Should ‘Garrin4e’ have considered moving all-in on the flop instead of going for the check-raise? Do you think Gimbel called because he felt priced in or because he thought his hand was best? What other hands in ’Garrin4e’s’ range is Gimbel beating? The Ukraine’s ‘Garrin4e’ earned $492,542 for his fourth-place finish. The pot didn’t change Gimbel’s status on the leaderboard in third place, but it did tighten up the stacks. After Switzerland’s ’th’Kick’ was taken out in third place, Gimbel and Carrel decided on a deal, leaving some money left to play for. In the end, Gimbel finished runner-up, taking home $1,122,873. Carrel was crowned the champion, and pocketed a cool $1,200,899 for his efforts. What would you have done and why? Let us know in the comments section below and try not to be results oriented. The best answer will receive a six-month Card Player magazine digital subscription.